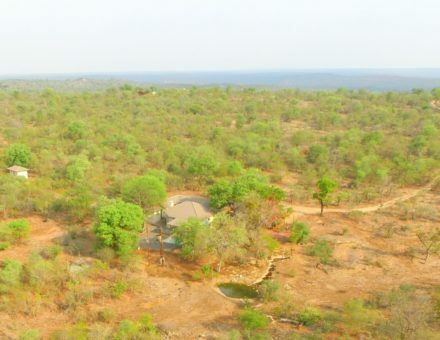 Antares offers an alternative style of self-catering accommodation for those nature loving tourists who would prefer to get away from the city lights and traffic. 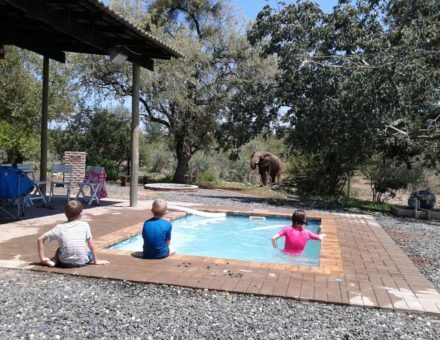 The accommodation is set within the Grietjie Nature Reserve where wild animals are free to roam as they please. Elephants and lions abound on the reserve and are frequent visitors to the small waterhole. The lodge will have four en-suite bedrooms which can accommodate a maximum of 8 guests at any time. There will be two twin rooms and two double rooms. Two of the rooms will be connected internally allowing for the option of a larger family room if required, but at the same time being able to operate as private rooms each with their own en-suite bathroom. Each room will also have an outside shower attached to it. There will also be an extra toilet next door to the reception for any other guests. 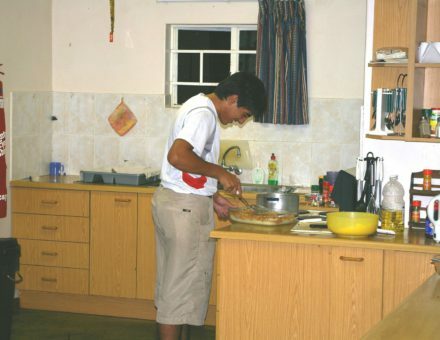 Inside the main building is a fully electrified kitchen, with all the basic equipment required for home cooking. There are ample supplies of crockery and cutlery and 2 fridge/freezers, a stove and a microwave. The kitchen is open plan and leads onto an indoor dining area that can seat 10 guests comfortably. Leading off the dining area guests will be able to relax in comfortable sofas in a large lounge area, absorbing themselves in an array of books and other artefacts from around around the reserve. A DSTV tv is available for those quiet days if the urge really takes you away from the bush. With two large patio doors leading off to a deck that wraps around the corner of the building guests can enjoy a meal on the deck or relax while watching game at the waterhole and listening to the resident Barred Owlet calling from the Baobab tree. A small plunge pool is available for those hot summer days and an enjoyable sundowner makes for the perfect end to a glorious day. There is also a small open fireplace for those cooler winter evenings and a separate braai area perfect for cooking those sizzling steaks that South Africa is famous for. 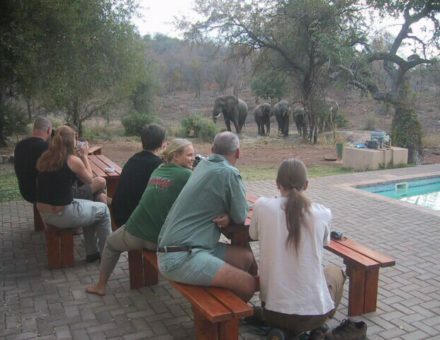 Why would you opt for a town location when you can enjoy your cold beer in the company of a herd of elephants, or listen to the roar of the lions as you sit around your open fire waiting for that delicious steak? There is a single strand electric fence surrounding the buildings which keep the elephants away, but other wildlife is free to come and go, so guests are advised to be aware of their surroundings at all times. For those guests that have their own transport we have covered parking for up to 6 vehicles. If you are one of the few tourists relying on public transport then transfers can be arranged from Phalaborwa or Hoedspruit. You just need to let us know your travel plans so we can make the arrangements to collect you and your luggage on time. Once you have settled in you have a choice of breathing in the fresh African air and just relaxing with the animals coming to you, or you can arrange to go on a guided experience, either in an open game viewer or on foot. The reserve is home to all of the Big 5 and so guests are unfortunately not allowed to go unaccompanied on the reserve for their own safety as well as for the privacy of the other landowners. Our rates are very competitive and when you factor in the surroundings as well, you will be hard pressed to find a more affordable location to experience your African Safari. The basic rates are R425/night/person. If you would like a twin room on your own there is a single supplement of R125 on top of the basic rate. Guided activities are extra and available on request. To make a booking or to inquire about availability please submit the booking form below. Please note that the current room configuration detailed below is according to the existing layout of the bedrooms but this information will be changing once we have upgraded and renovated the facilities. Room #1 (Hadogenes) single bed in a 4-bed dorm. R425/person. Room #2 (Hottentotta) single bed in a twin room. R425/person. R550 single supplement applies for private room. Room #3 (Parabuthus) single bed in a twin room. R425/person. R550 single supplement applies for private room. Room #4 (Uroplectes) single bed in a 4-bed dorm. R425/person. Minimum stay is 1 night. Deposit required equivalent of 1st nights stay. If booking is cancelled more than 7 days before arrival date, full deposit refunded. If booking is cancelled within 7 days of date of arrival full deposit is non-refundable. Credit card facilities available. We also accept payment in cash or by EFT.